Dubai, UAE: Emirates Airline and Google are ‘Celebrating Arabic Reading’ all through October in a collaboration to reach millions of smartphone users in the region, and support the UAE’s Year of Reading, a national initiative spearheaded by HH Sheikh Mohammed bin Rashid Al Maktoum. The aim of the UAE’s Year of Reading is to nurture an entire generation of lifelong readers, and ensure the groundwork is in place to support the country’s knowledge economy goals. The mission of the ‘Celebrating Arabic Reading’ initiative is to make Arabic books more accessible for first-time online book readers and book lovers alike with unprecedented discounts of up to 90% off on online books at the Google Play Books store, the world’s largest ebookstore that hosts more than 5 million titles and offers readers smart technology. Discounts are valid across nine countries in the Google Play Store (both in IOS and Android) for: the UAE, Kingdom of Saudi Arabia, Qatar, Bahrain, Oman, Kuwait, Lebanon, Jordan and Egypt. This is the first such online book initiative, and the first discount of this scale in the region at the Google Play Store. For a four-week period, Google will run its highest ever discount on the Play Books store on more than 4,000 popular fiction, non-fiction and children’s titles in an effort to reach millions of smartphone users in the Middle East and GCC. His Highness Sheikh Ahmed bin Saeed Al Maktoum, Chairman and Chief Executive, Emirates Airline and Group commented on Emirates’ partnership with Google: “Books can stimulate, inform, touch minds and hearts, and open up a world of possibilities for readers. As founding sponsors of the Emirates Airline Festival of Literature, we are staunch supporters of the written word. 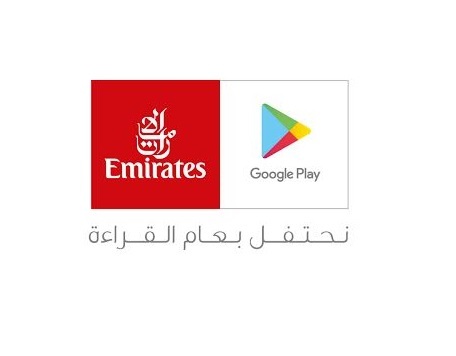 To showcase the best of Arabic content, Emirates also commissioned the Emirates Airline Festival of Literature and the Emirates Literature Foundation to help identify and curate a collection of over 50 Arabic books in the Google Play Books store that will be discounted at 90% off. This curated book collection encompasses a wide variety of bestselling fiction and nonfiction titles such as Rua Falsafia Fel Hekam Wal Forousia and Tell You About My Tribe, as well as a robust list of children’s e-books like Creatures on the Ceiling, Altghrayib Al-Bilaliyah and I Love. Emirates actively supports and sponsors a number of educational and cultural initiatives in the UAE, including the Emirates Airline Festival of Literature, which last year attracted over 40,000 participants, 170 writers, thinkers and speakers from 35 countries. The airline also supports literature through its extensive audio-book section on ice, as well as engaging author interviews on Emirates World, a popular channel on ice. In addition, Emirates SkyCargo recently carried almost 8 tonnes of books to different parts of the world to support reading. Internet connectivity and mobile technology has helped cut the information divide in the Arab world. More people than ever own or have access to a digital device, whether it is a tablet, mobile phone or laptop. According to the Mobile Economy Arab States 2015 Report, over 200 million people across the region are subscribed to a mobile device, presenting a unique opportunity to deliver e-book and educational content. The UAE 2021 Vision and National Agenda includes a direct emphasis on Arabic language literacy. Data from 2014 shows that just under 60% of students are currently at this level in the UAE. By 2021, the UAE is targeting that 90% of students have proficient Arabic literacy skills. According to UNESCO research, 67% of adults living in Arab States have basic literacy skills, compared to a global average of 82%, underscoring the need for developing local, relevant Arabic content on the web which is central to information knowledge sharing. Google Play Books is the world’s largest ebookstore and offers readers smart technology that caters to an on-the-go lifestyle — where people can start reading a book on tablet at night and pick up where they left off the next day from their smartphone. Features like bookmarks, notes, and word definitions also enhance the reading experience on Play and makes it more enjoyable and productive. Google Play Books has more than 5 million titles available (free and paid).